England's Karen Bardsley earned her goalkeeping stripes on the sunny soccer pitches of Chino Hills in northern California - a far cry from the traditional climate of north west England, where she now plies her trade for Manchester City. Born in California to a football-mad family from the red half of Manchester, the young shot-stopper was raised on a diet of Premier League football and Panini stickers so, when the time came to choose her national team, it was the Three Lions all the way. Club Website caught up with Karen to hear about her experience of grassroots football in the United States and how it shaped her outlook on the game. We discuss her football journey from California to Greater Manchester, from her very first football kit to winning a bronze medal in the World Cup. Throw in some bigger issues like developing the culture of women's football, being a role model and raising awareness of bowel cancer and you've got what makes for a very interesting conversation. So sit back and relax while we take England goalkeeper Karen Bardsley back to her roots. CW: Let's start at the beginning. What was the first soccer team you played for as a girl growing up in California? KB: I first played with an organisation called the AYSO - the American Youth Soccer Organisation. We didn’t really have the equivalent of school teams at that age, so this was an organisation where kids could go to try out sports or, more specifically, soccer. That started from the age of four or five and I played there for a couple of seasons, getting selected for effectively the all-star team at the end of each season, where you would go and play the equivalent team from the next city. I then got selected by a local club team and it all started from there. They were called the Chino Hills Nightmares, which is quite a name for a team of 10-year-old girls. I guess it was fitting. What was your regular position as a kid? Early on we all just rotated around to try different positions and see who was best where, so for the first few years I was mainly a winger who spent some time in goal like everyone else. But once they found out I wasn’t afraid of the ball, I ended up spending more time there and, by when I got to about 10, I realised I was just better in goal and the rest is history really. What are you abiding memories of football at that early age? Oh it was great. I still play football because it's fun. That's my biggest driving factor and that was the best thing about it back then. I can still remember going to my first training session in this random park down the road from my street. We just loved getting out there. We looked like a bunch of ragtag idiots in jean shorts with our shin pads on the outside of our socks. We just didn't care; we were having fun and it just got better and better. The most exciting thing about that whole time was the day that the coaches brought our first match kit to practice and we got to try it on for the first time. I can remember the smell. It was so exciting. You'd just turned seven when the USA won the inaugural Women’s World Cup in 1991. Did the national team have any influence on you growing up? If I'm honest I don't actually remember that first world cup particularly well, but the first female superstar I remember seeing was Mia Hamm. She went to the University of North Carolina and was smashing records and so it was then, about ‘92 or ‘93, that I started to really clock on to the international team and women's football. It was a special occasion when the women's national team was on TV. I remember watching them and thinking "wow", but as a kid it never really popped into my head that I could do this professionally. You just do it because you enjoy it so much. I said to friends in high school "wouldn’t it be cool if we made it to the Olympics?" but you never think it will happen. I don't think it was until I was in college, when the first women’s soccer league - the WSA - started in America, that I actually considered it as a possibility. When you reached that stage, did you have notions of playing for the USA or did you always want to play for England? Growing up, Dad and I would watch the Premier League pretty much every weekend. Other than the odd national team game, the Premier was all there was to watch. Plus my whole family in England were all football mad and big Man United fans - which is a bit difficult to talk about now I play for City! - so they’d send me loads of kit and Panini stickers and stuff. Then when I was about 14 or 15 and the internet had first started, I stumbled across the FA’s website and noticed that England had a women’s football team, which I never even realised. I thought "wouldn’t it be amazing to play for them?" So I started writing to the FA, saying "I’m here! How do I play for you guys?” I asked them for a trial, sent them every clip I could find, VHS tapes of my games at university when I got there, and it wasn’t until after my first year of university that I heard back, so I was pretty persistent. England came on tour to North America and asked me to fly out to Alabama for a trial. I went out for two days, but then was back home watching on TV when the US beat them 6-0 and they lost twice in Canada. I thought "well, here we go!" but it was something I always wanted to do. I’m really proud of my heritage and, more specifically, my parents. It meant a lot to me. After being called up to the under-19s for the 2003 European Championships in Germany, Bardsley was drafted into the senior squad aged just 18. She made her senior debut in 2005, but then broke her leg whilst playing for her university and ended up out of the England setup for four years. She was called up to Hope Powell’s squad for the 2009 European Championships, but had to settle for a role as understudy to Rachel Brown, before taking over as first choice ahead of the 2011 World Cup. She hasn't looked back. Since taking over the number one shirt, you’ve been involved in the most successful period for women’s football in England, from filling Wembley with Team GB at the Olympics to winning a bronze medal at the World Cup last year. What has it been like to be part of that? It's been amazing. London 2012 provided us with a chance to put women's football on the map and I think we made people sit up and take notice. Playing at Wembley for the first time was absolutely incredible and the Olympic football was an amazing competition, but it feels like you're part of a much bigger festival of sport. The World Cup is just pure football and our time in Canada was just amazing. Even thinking about it now I still get goose bumps. Obviously things didn't start out as well as we would have hoped, but once we started believing in ourselves and got some momentum, it all just started to happen for us. The Norway game was one of my favourite games to play in and then the next game against Canada, we just kept on breaking barriers. Against Japan in the semi-final, I felt we played really well and probably deserved a bit better from that game. It was heartbreaking the way it finished. We really believed we were going to be in that final, so it was tough. There are no words really, but we showed such character to pick ourselves up, dust ourselves down and beat Germany in the bronze medal final. We you aware of how much the nation had got behind the team back home? A few things had trickled in while we were away, but we didn't realise how much of an impact it had made until we got home and back playing in the WSL [Women’s Super League], where there were huge crowds at the games. People started recognising us, which was like "what?". We met Prince William, went to Wimbledon and to 10 Downing Street. It was just crazy. The recent success of the national team has helped women and girls’ football at grassroots level go from strength to strength. How proud are you of that? Really proud. In the bigger picture, our job is to leave football in a better place than when we found it. When I retire, the best thing for me would be to say I helped the game move forward. It will hopefully be in a much better place and girls can make a living out of it. It's really important for female athletes to feel included and empowered to do what they want, without the fear of ridicule or anything like that. I'm really excited about the way the game has picked up and the amount of girls playing football now. 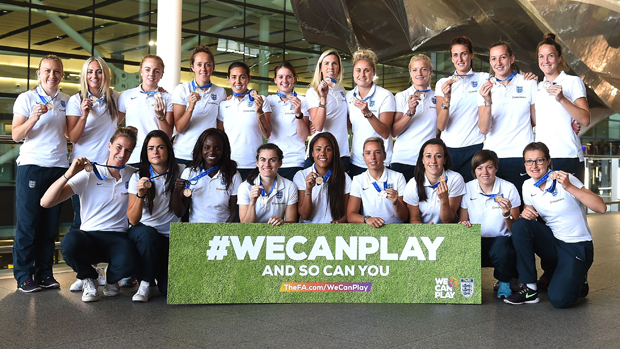 The FA's Girls’ Football Week is coming up and the number of girls taking part is amazing. 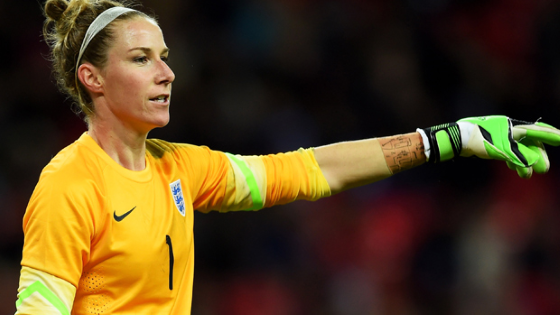 How do you feel about being a role model and girls wanting to be the next Karen Bardsley? I’ve never really thought about myself like that, so it’s a bit weird when people describe you that way. It’s very flattering, but every time someone says that to me, it makes quite an impact. It’s crazy seeing someone with your name on the back of their shirt, but all I can say is I hope it just keeps carrying on. It’s something much greater than me or the team - it’s a living and breathing culture that we’re trying to create. Talking about being a role model, you're an ambassador for Know the Score. Could you tell us a bit about the charity and what they do. Know the Score is a fantastic charity that uses football to raise awareness of bowel cancer. It's so important to raise awareness of the disease and its symptoms, as there are some misconceptions out there, such as people thinking that bowel cancer can only affect older people. Nicky Johns, who founded the charity, had a horrible experience when he lost his 26-year-old son to bowel cancer. They didn't know much about the disease and they didn't realise it could happen to someone so young, so to just raise awareness is the least we can do. Every 90 minutes three people in the UK die of the disease. A lot of people don't want to talk about it and things can get left, but catching it early makes such a big difference. The key message is that if you recognise any of the symptoms - more info here - or if you're unsure, go and see your doctor. The chances are it'll be nothing, but it's better to play safe and you're not wasting anyone's time, so go and get it checked out. We're almost out of time, but back to the football briefly. Manchester City have established themselves in the WSL now and are improving year-on-year, with Champions League football in store this autumn. How are you enjoying life at the club? Yeah, I’m so proud to be a part of what Man City are doing for women’s football. They include us in everything that’s going on, we train alongside the men pretty much every day. It’s the most professional organisation I’ve ever been a part of. There are loads of good people working there who want the best for the club. It’s really a breath of fresh air to feel included and not just a tick box. I love the way they play, the methodology and it’s the most fun I’ve had playing for a very long time. Coming from a family of Man United fans, did you take a lot of stick from your folks when you signed? The one thing my dad said was: “At least you’re not playing for the men, so it’s alright”. I take a bit of stick from friends but, overall, I think they see the bigger picture really. Finally, do you have any advice for young girls out there hoping to follow in your footsteps? The biggest thing is just to make sure you’re enjoying your football, going out there and having fun. Play wherever you can. Play with the lads. It will help your speed of thought and technical development. If you’ve got brothers, go and play with them, and watch as much football as you can. But the biggest thing: don’t ever let anyone tell you you can’t do something. Go out there and do what you want because you want to do it. Karen Bardsley is an ambassador for Know The Score. Visit knowthescore.org.uk to find out more, or follow @KnowTheScoreUK on Twitter. Images courtesy of The FA / Getty Images and Know the Score.